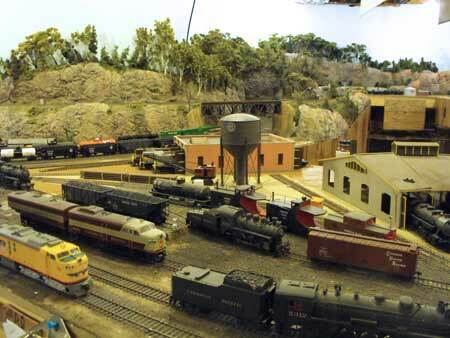 The 5th annual Muskoka Layout Tour was held on October 4, 2009. The Muskoka cottage country is north of Toronto, Canada. There were 19 layouts on the tour from south of Barrie up Highway 11 to Huntsville. I managed to visit half a dozen during my 343 km round trip. 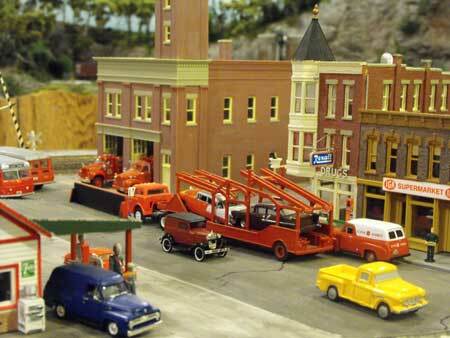 The layout tour was on the same weekend as the Brampton train show. 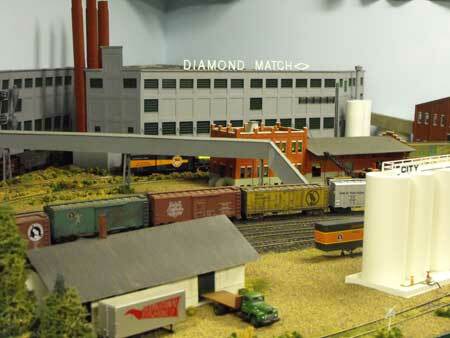 Our Nottawasaga Model Railway Club (NMR) was once again exhibiting in Brampton which is a suburb northwest of Toronto near the airport. 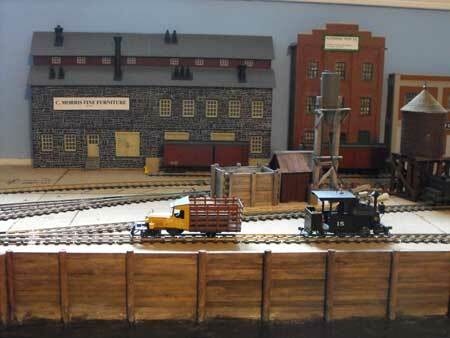 I worked the Brampton show on Saturday and played hookey on Sunday to go on the layout tour. 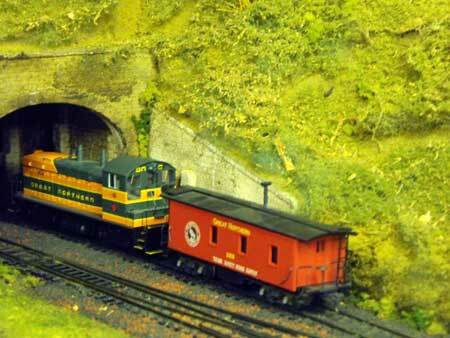 There are many superb layouts on this annual tour that usually takes place in late September. 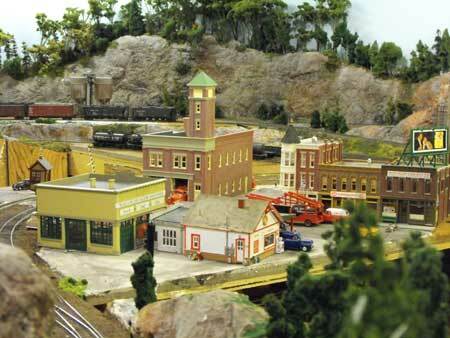 I had visited several during the NMRA's National Train Show in Toronto a few years ago. 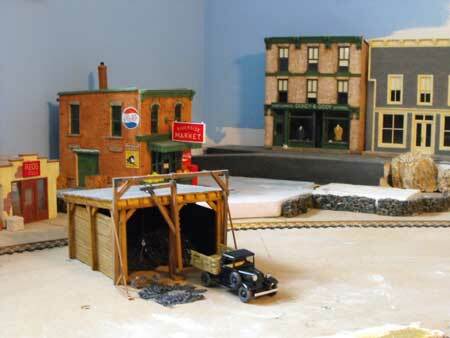 It was fun to see what had been added to these layouts and to see others that I'd never seen before. 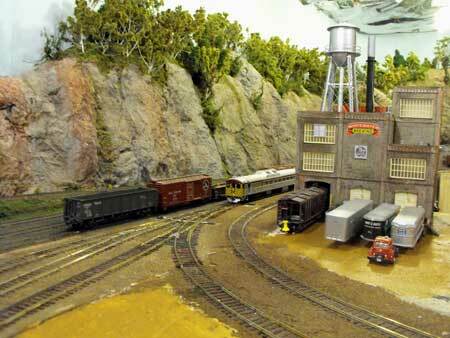 First, here are a few photos of Scott Reid's HO scale Great Northern Mesabi Division layout. 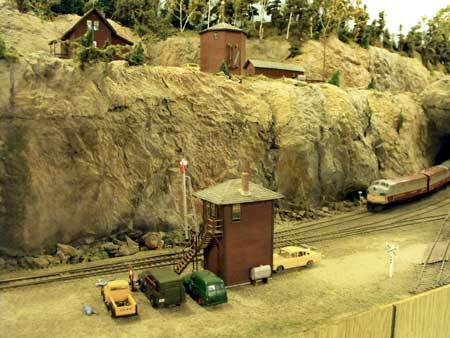 The layout is 32' x 14' and is set in Minnesota during the 1950s. 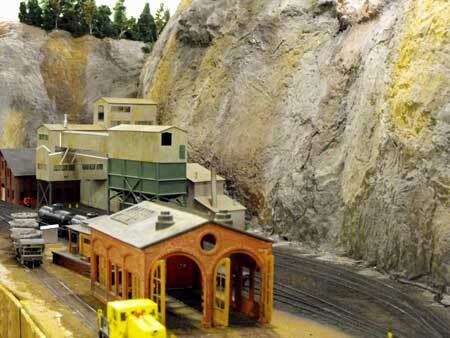 Lots of ore cars and a great model of the ore dock that Walthers produced. Control is by DC walkaround memory control with blocks. Scott has a theatre background that he put to good use with his curtain valence and skirting. I have a photo of his skirting idea on my benchwork page if you're looking for an inexpensive solution to hide all that clutter underneath your layout. 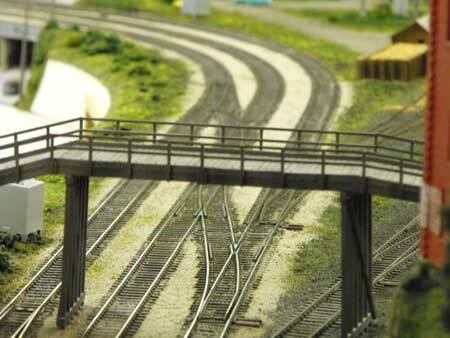 More railroad pictures, both model and prototype, can be accessed from my Train Photos Gallery. 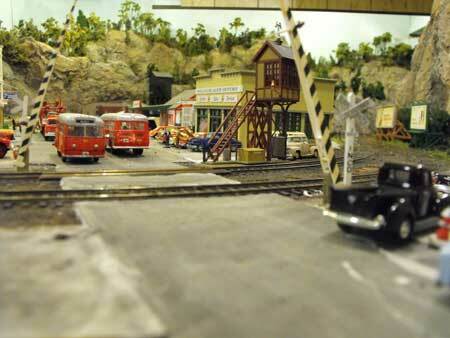 I've also posted a video from an operations session on Al Crisp's layout focusing on Train 431/432 operations. 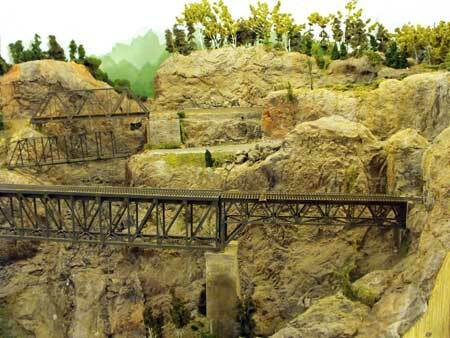 Al's layout is well-known in the region. 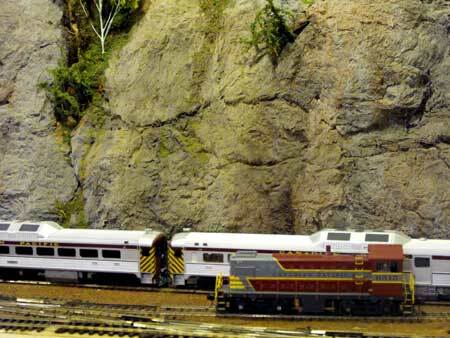 I first saw it during the 2003 NMRA National Convention. I am a semi-regular operator and attend sessions when I can. 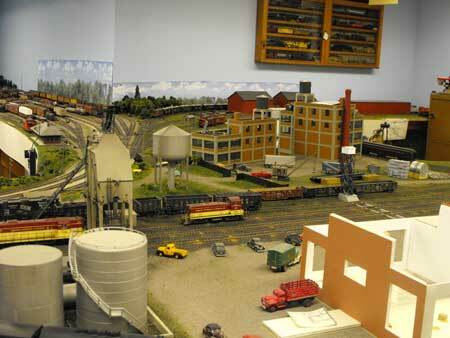 It is a large 52' x 24' model railroad and is 95% complete. It operates with DC radio throttles under block control. 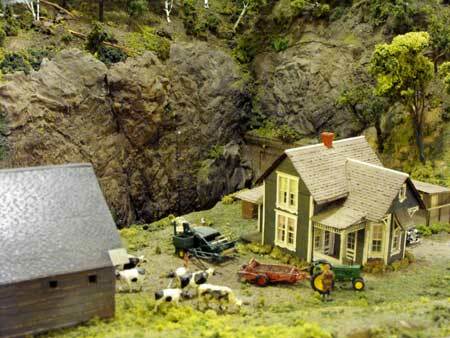 Al models the Canadian Pacific Railway (CPR) north of Lake Superior. 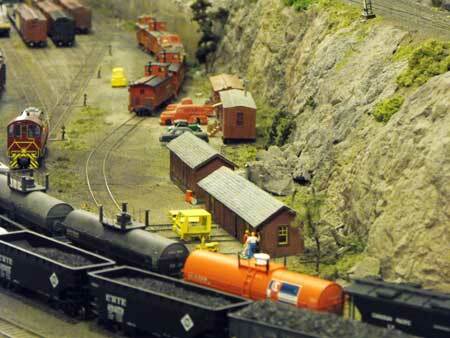 The layout features both steam and diesels pulling long trains on wide curves. 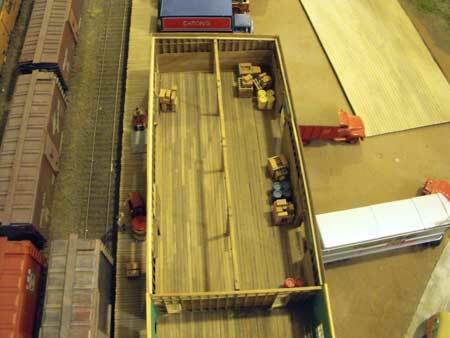 The track is handlaid Code 70 and 55. Scenery reaches to the ceiling in places. 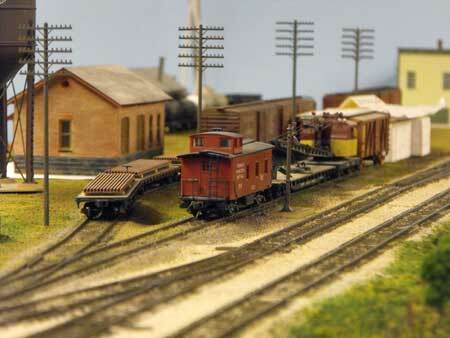 This is a gorgeous layout that runs very well. It is great fun to operate with Al's hand-written waybills following the CPR practice of the 1950s. 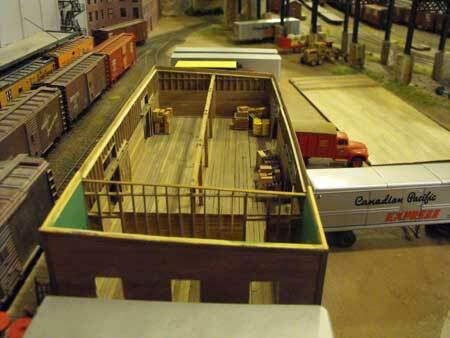 I've included the last two photos to show the scratchbuilt interior of this warehouse. 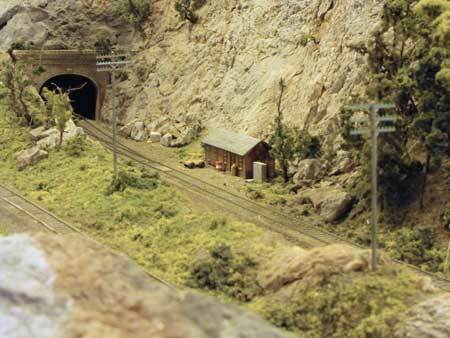 Al is currently working on a section of catenary leading to the mine shown in the top photo.He is using wooden poles like the prototype. 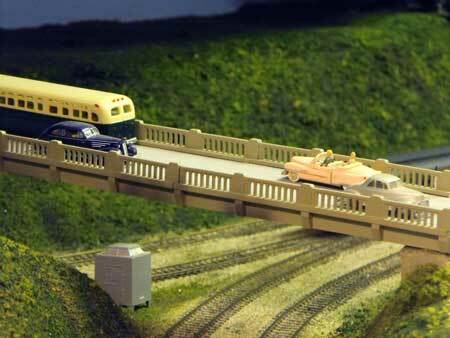 Their layout represents the TH&B between 1952 and 1955. 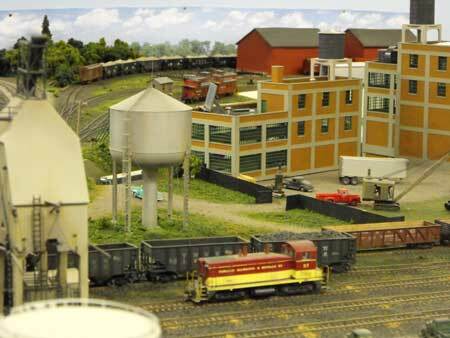 The principal feature of this layout are the main line and yards around Hamilton, Ontario. 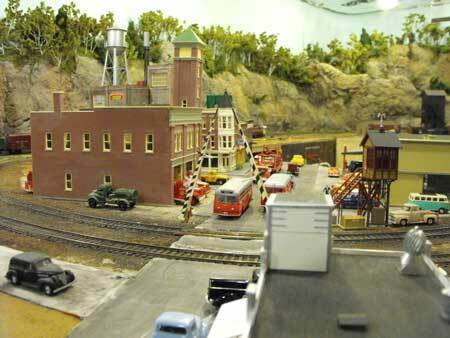 John says the layout was started in 2001 and was up and running for the NMRA National Convention in 2003. Operating controls are by Digitrax with 10 handheld throttles. 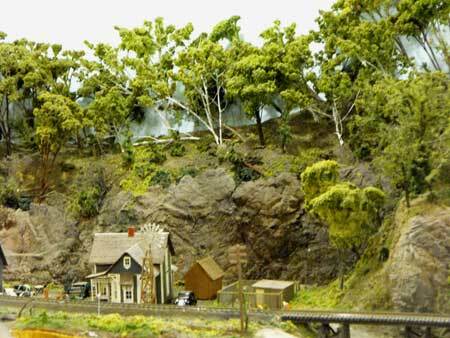 The two-level 20' x 30' model railroad has mostly Code 83 track with Code 100 in hidden areas. The upper level, about 6"to 8" above the lower level, is modular and can be removed for work to prevent damage to the lower level. 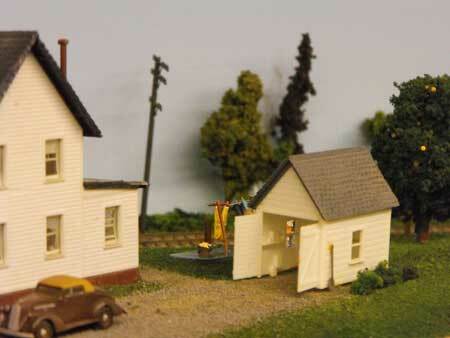 Buildings are a mix of kitbash and scratchbuilt to capture the look of the the TH&B. 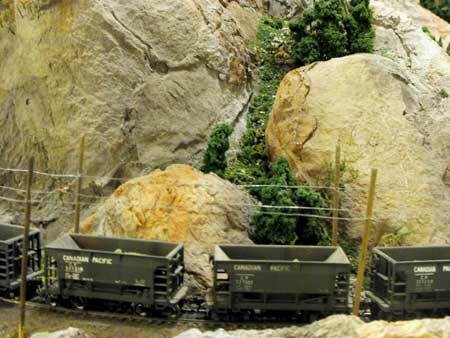 ON30 is O scale narrow gauge running on HO width track. The tie spacing is different. 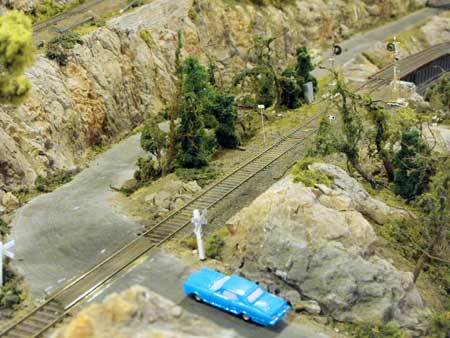 Dave's layout is 30' x 10' and has about 50% of the scenery finished. 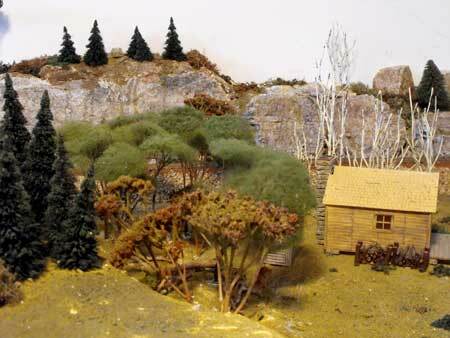 What it does have are some terrific scratchbuilt buildings. 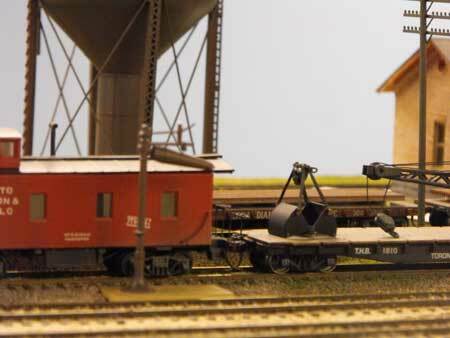 Dave uses Easy DCC with CVP wireless throttles. I show photos of his sector plate on my benchwork page. 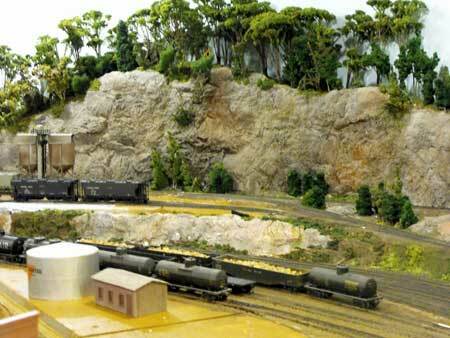 Here are the videotaped segments I took of the Spring's HO layout and Dave Smith's ON30 pike. 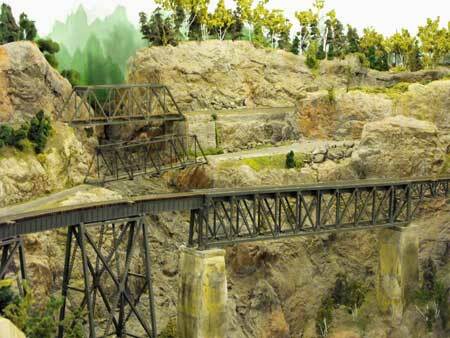 I've also included footage of two layouts by Ron and Marion Colpitts. 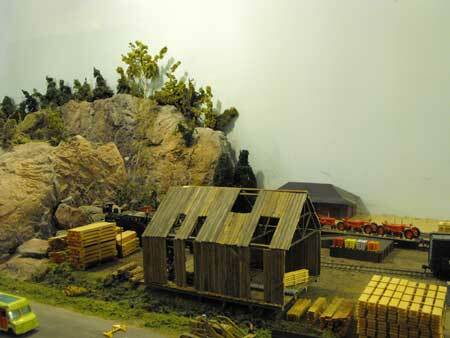 They have a G scale garden railroad and an N scale layout indoors that is built into the room's furniture. 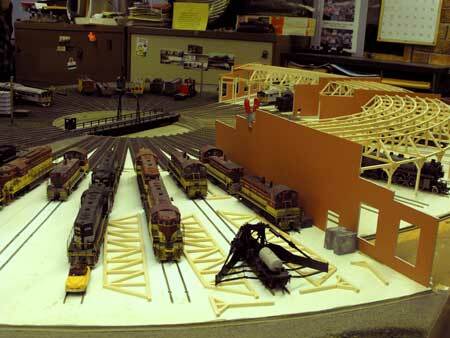 I first saw this layout during the Toronto NMRA National convention. 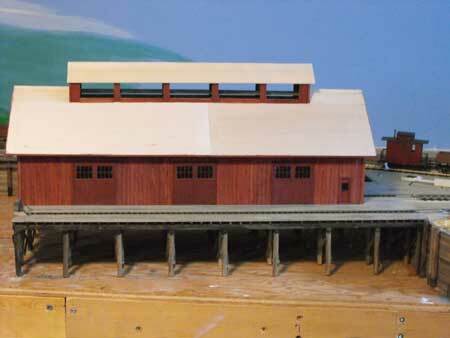 Since then Ron has added thr container terminal. 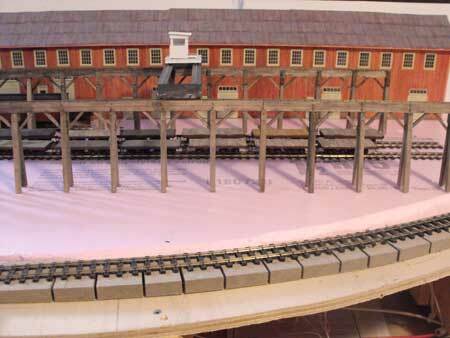 The railroad circles a 10' x 20' recreation room and then wanders through the laundry room to create a 25' x 50' loop. 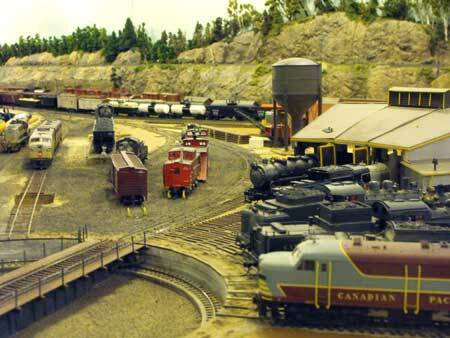 The layout represents the Revelstoke Division on the Canadian Pacific Railway (CPR) in British Columbia. Ron ran a long train for me. 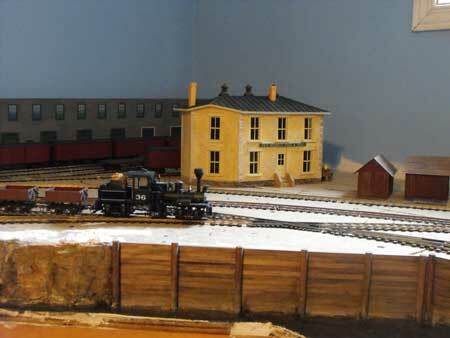 The video clip begins with John and Laura Spring's layout under steam. 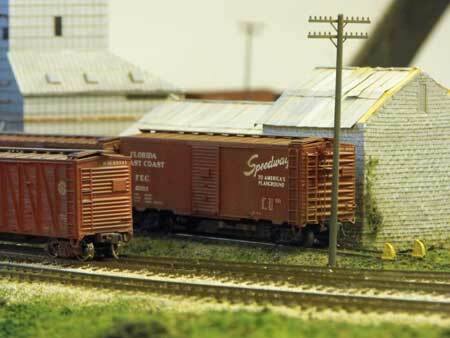 Click here to go to my Train Photos Overview page.